As per sthalapurana, the plantain trees in the orchids got destroyed regularly for no reason. The owner offered to the Lord a plantain tree made of gold. Since then, with the grace of the Lord, the trees grew tall and in plenty. This variety of the plantain is the Naendram vazha. The natives worship the Lord as Vamana. The grand annual uthsav is conducted druing Onam Festival. (Avani - Tiruonam). The plantain trees in this thalam would not yield fruits & the farmer prayed to this Lord & offered plantains in gold. Ever since there was good yeild of large sweet plantains & it is beleived that these are the Nendram fruits popular in Kerala. This gold fruit in the sannadhi went missing & the farmer doubted and troubled a yogi. But, it was finally found in the sannadhi itself. The yogi committted suicide & was considered to be roaming the area as a Brahma Rakshasan. Devotees built a small temple for the yogi & offered him daily neivaediyam to appease him. Access to the temple 3 Kms from Idaipalli Railway Station(Ernakulam - Shoranur line). The Moolavar of this sthalam is Katkaraiappan. Moolavar is found in Nindra Kolam facing his thirumugham along the south direction. 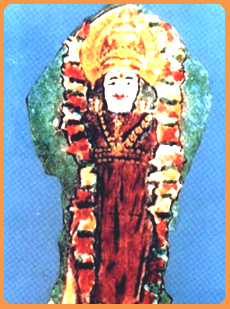 Prathyaksham for Kapila munivar. This divyadesam is situated in a small village which is found next to Ernakulam in Kerala state. It is found close to Idappalli. when going in train, we have to get down in Irugnalakkodi railway station, which is found on the railway lane between Aalvaai and Thirucchoor and if we get down in Angamaali railway station, we can reach this sthalam if we travel about 9 kms through North east direction. There is no lodging facility. So, bhaktas can stay in Ernakulam to get the seva of the perumal.